Power, aesthetics and design the FX cyclone is a .177, 12 ft/lb air rifle ideal for target shooting or hunting. It's has a plethora of features to ensure a comfortable shooting experience. The FX Cyclone features a Synthetic stock, making for a durable build and high quality aesthetics. This Stock is ambidextrous making it comfortable for both left handed and right handed shooters. This comfort is then furthered by the Rubber recoil pad that acts as a shock absorber reduce the strain of recoil on your shoulder and surrounding areas. The forgiving soft grips fitted on the pistol grips reduce fatigue to your hands helping prolong shooting time. The Rifle comes in a .177 Caliber and is full 12ft/lbs power. The barrel is full match grade for the highest, accuracy and power available. To then further this the trigger is match grade and is also fully adjustable (400-700g) allowing for customisation to each person. Scopes and other optical accessories can be attached to this rifle via the 11mm dovetail scope mount. 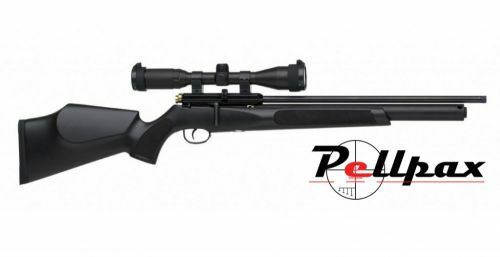 This PCP rifle comes with a pressure gauge allowing you to see exactly how much your rifle is filled. Using a straight pull cocking system with a thumb return the rifle can be cocked and loaded within seconds for rapid shots. The Cyclone .177 has a 8-shot magazine which co-operates nicely with the straight pull cocking system.